Instead of buying store-bought sugar-free lollipops, you can use candy making ingredients to create your own at home. Sugar-free syrups and sweeteners are used in place of sugar and corn syrup in traditional lollipop recipes. 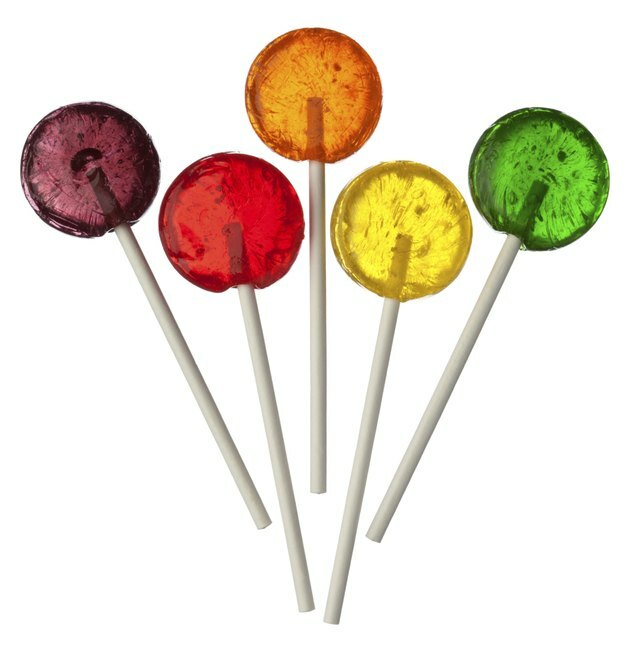 Artificial sweeteners that can be used to make sugar-free lollipops include sucralose, malitol or isomalt. For each flavor or color, you'll need to make a separate batch of the sugar-free lollipop mixture. Once lollipops are done, you can serve immediately or wrap them individually with cellophane or plastic wrap. Spray the lollipop molds with non-stick cooking spray. Place a lollipop stick in the center of each candy mold. Mix together the malitol and the vanilla syrup in a saucepan. Heat the mixture to a boil over medium heat. Insert a candy thermometer into the liquid while boiling. Keep the mixture boiling until it reaches 300 degrees Fahrenheit. Remove the saucepan from the heat. Stir in the food coloring once the boiling of the liquid has stopped. The food coloring is not required to make the sugar-free lollipops, but makes them look more appetizing. Add your candy flavoring oil to the liquid. Purchase a set with multiple flavors included. Flavor oil examples include chocolate, root beer, butter rum and peppermint. Artificial flavors are used to make the oils and they do not contain sugar. Stir thoroughly. Pour the liquid into each candy mold slowly. The mixture will still be hot so wear gloves to avoid scalding. Remove lollipops from the mold once they have cooled and retain their shapes. Allow them to finish cooling on the countertop. Instead of mixing the ingredients to make your sugar-free lollipops, you can purchase a pre-made sugar-free candy making mix. You simply add water and place candy mixture into molds. Avoid using flavored cooking sprays to coat the candy molds. They can adversely affect the taste of the candy.